That cover and editorial will certainly shake up your subscriber list. I would have expected more from a publication run by Jesuits - once the intellectual arm of the Church. Things have changed greatly since I attended a Jesuit high school. The most charitable thing I can say about your position is that it is misguided, ill-conceived, and harebrained. The country tried an almost-as-idiotic thing some time ago, with the 18th Amendment: prohibition. It turned out to have been such a gigantic mistake that that Amendment had to be repealed, some 13 years later. I commend to your reading "The Federalist Papers", which made the case for the Federal Government, and to histories of the Convention. Some members wanted the first 10 Amendments included in the original Constitution, and were persuaded to sign only on the assurance that they would be ratified shortly after, Consider the wording of the Bill of Rights: "Congress shall make no law respecting ...."; ... shall not be infringed"; "No Soldier shall, in time of peace be quartered in any house...."; "... shall not be violated, "; "No person shall be held...."; "... shall enjoy the right to a speedy and public trial..."; "... the right of trial by jury shall be preserved,"; "Excessive bail shall not be required,..."; "... shall not be construed to deny or disparage others retained by the people"; "The powers not delegated to the United States by the Constitution, nor prohibited by it to the States, are reserved to the States...". One after another, these limit the power of government over the people. To argue only from practicality, this proposal would amount to putting the toothpaste back in the tube, the cat back into the bag, and the evils back into Pandora's box. There are millions of firearms in circulation, among both good men and evil men. As long as evil men have them, good men need them for their protection. On another practical issue, that proposed Amendment would need to be ratified by 2/3 of the States - something as unlikely as the Cardinals electing the Caliph of Baghdad the next Pope. On a larger scale, the pages of history are littered with stories of countries who either would not or could not arm themselves against neighbors who both would and could. It is much less than wise to tamper with the Bill of Rights, I also think a good case might be made that gun availability is not the root cause of gun violence. Consider how many of those millions of weapons in circulation have not been used to kill. Gun violence is most likely caused by the breakdown of civil society, brought about partly by the welfare state, the one-parent family, the children who live in isolation, touching others only through tiny little keyboards. Consider also how many of the recent round of school shooters who were "maladjusted loners". We can all agree that there is a problem. The hard part, the "trick", is to find out how to address it, Taking away guns will not assuage the rage that seethes in those at the edges of society. Murder will still happen, if not by guns, then by knives, poison, even by hand. Obviously availability of guns is not the problem as the liars writing the article also erroneously claim the US has the highest gun ownership rate in the world per capita. This is false. Switzerland has the highest per caita gun ownership and their guns are supplied by the government. They are all military grade, full auto capable rifles. Where is all the gun violence in Switzerland? As well as completely ignoring the fact that uses of guns for good outweigh the criminal (even using the erroneously included suicide by gun) by a factor of between 20:1 to 60:1 according to multiple studies. The author obviously has never tried to purchase a gun 'legally'. They refer to "lenient gun control laws". Every gun purchase that I have ever made, required me to show my identification; concealed carry license; fill out the form that would incriminate me if I lied; and required a call to the FBI to clear the purchase. Where did they get their statistics? All emotion, no reason. Please do yourself a favor and educate yourself by reading, 'More Guns, Less Crime' by John Lott. I'll be kind, because I don't want to effect the fragile mental state of the author, because they might get a gun and shoot someone, but he/she is a lunatic. Our guns are for protection from our government as much as they are from the criminals. Freedom isn't free. Repeal the Second Amendment and the First and all the others go away. This article has the feel of the Progressive Social Justice infestation that has seeped into the Catholic Church. One can only pray that Pope Frances can clean it all out. The Catholic Church would like America to abolish our gun rights as seen by these comments here. Our Founding Fathers gave us the First Amendment preventing The establishment of religion (the Catholic Church). People who don't want us to have guns will have to use guns to take them from us! How many "children" will die in that war??? The First Amendment was written to allow complete freedom of speech. The Second Amendment was written to enforce the First Amendment. With an entire population disarmed there will be NO freedom. The problem is not guns, the problem is guns in the wrong hands. All of the shooters in the mass killings in recent years (Columbine, Sandy Hook, etc,etc were taking medications that can have disturbing influences on the mind. The murders were done by people who were under the influence of mind altering drugs. Some of the drugs have warnings that clearly warn of side effects such as thoughts of suicide and a multitude of other negative side effects. It seems like there should be more care in prescribing these drugs rather than disarming a nation. Clearly there is no easy solution, but the cause of the killings should be more carefully assessed. The government uses these mass murders as a way to fulfill a more sinister agenda. I fear that Americans with good intentions are unaware of the results of total disarming themselves. I know it may sound a tad racist but is taking a district which is 90% African American and over-analyzing how gun control affects THEM a poor analogy for how gun control might affect the rest of the nation? I mean the rest of the nation doesn't spend it's pay check on lotto scratch off, dope and schlitz malt liquor then try to resolve the rest of the week with a Saturday night special and ski mask. I'm just sayin! Don't hate the messenger because you don't like the message..
“the new law helped to prevent nearly 50 deaths per year”. My own view on gun control is simple. I hate guns and I cannot imagine why anyone would want to own one. If I had my way, guns for sport would be registered, and all other guns would be banned. ...consider the tragedy in Aurora. Imagine if just 10 other people in that movie theater had been carrying guns. In the confusion of the onslaught, would fewer people or more people have died when those 10 other people opened fire in the dark? We do not have to live in such a world. Both Australia and Britain, for example, experienced gun massacres in 1996 and subsequently enacted stricter gun control laws. Their murder rates dropped. Americans must ask: Is it prudent to retain a constitutionally guaranteed right to bear arms when it compels our judges to strike down reasonable, popularly supported gun regulations? Is it moral to inhibit in this way the power of the country’s elected representatives to provide for the public safety? Does the threat of tyranny, a legitimate 18th-century concern but an increasingly remote, fanciful possibility in the contemporary United States, trump the grisly, daily reality of gun violence? Legitimate defense can be not only a right but a grave duty for one who is responsible for the lives of others. The defense of the common good requires that an unjust aggressor be rendered unable to cause harm. In the national imagination, the Constitution is too often thought of as a kind of sacred text. Yet neither our founders nor our forebears held to that view. The Constitution is mere human law. Yet that document, human as it is, recognizes and protects the texts and ceremonies that are sacred to us. Perhaps the reason we have enjoyed our freedoms as long as we have is the presence of guns in our country, and culture. Consider that all too often those that argue in favor of gun control are the ones who argue in favor of unlimited abortion. They are the ones who seek to reduce the role of the church or religion in every facet of American existence. They argue the “separation doctrine” to the point where wishing someone a “Merry Christmas” on government property results in an EEOC complaint and ACLU lawsuit. And they argue that guns prevent them from enacting the social policies they, in their wisdom, have determined that we need. A group of Black religious leaders recently released a statement where they expressed that gun control is really about controlling people, and emphasized the racial considerations present in many of the “gun control” laws in this country. Are we so blind as to not see this ourselves? A basic premise of the article (and of the gun debate in general) is that fewer guns would result in fewer murders. However, when comparing gun ownership rates per country with murder rates per country* there is very weak correlation between the two. And what correlation there is is actually negative -- meaning lower gun ownership rates result in higher murder rates. * I used the Wikipedia statistics on "Number of guns per capita by country" and "List of countries by intentional homicide rate". The correlation coefficient comes out to be -0.22. A correlation coefficient is a number between -1 and +1 with -1 being the strongest negative correlation, +1 being the strongest positive correlation and 0 being absolutely no correlation. FROM THE EDITORS: Many thanks for this spirited discussion! Please bear in mind the following: The editorial does not take issue with the natural right to self-defense, which is God-given and unchangeable. The editorial takes issue with one specific, prudential application of that right, namely, the right to own a gun as specified in the second amendment. The right to own a gun is not a natural right, but a positive right, meaning it is a human-made and changeable right. Those who maintain that the editors are questioning the right to self-defense in their call for repeal are making a categorical error. Amendment II.A well regulated militia, being necessary to the security of a free state, the right of the people to keep and bear arms, shall not be infringed. "Who are the militia? Are they not ourselves? Is it feared, then, that we shall turn our arms each man gainst his own bosom. Congress have no power to disarm the militia. Their swords, and every other terrible implement of the soldier, are the birthright of an American.... [T]he unlimited power of the sword is not in the hands of either the federal or state governments, but, where I trust in God it will ever remain, in the hands of the people." Thus an argument against the individual right - despite the afterthought of categorizing it as a "positive right" (when it was clearly not ascribed as such - consider the Declaration of Independence and the reference to "endowed by their Creator with certain unalienable Rights"), and the artificial limitation of the call for repeal to somehow apply to firearms alone... it is at worst an insult to our intelligence and at best a hasty and ill-prepared bit of apologetic sounding covering of one's backside. And let us say that we banned guns. We have now condemned the weak to be prey of the strong, as it was in days of old. The phrase "God didn't make man equal, Colonel Colt did" is not an advertising slogan from the 1800's, but a reflection of the reality that human ingenuity had provided a means of defense to the weaker, older and feebler amongst us against the largest and strongest of thugs and evildoers. Kind of like the rock and sling, albeit without His hand to guide it. And if the Founders were correct in their observations of the human condition - that is, that the 2nd is the guardian of the other Amendments - how long before you would be publishing an editorial calling Catholics and other people of faith to action against the government movement to eliminate organized religion on the basis of "tolerance", "diversity" or some other machination of those that would see us believe in a kingdom of man instead of the kingdom of God? Many times it only takes a small percentage to stand and fight for what is right to protect the whole from tyranny. But what could we do as defenseless as we would be to stand up for the beliefs that we have, or for the beliefs and rights of others, if your suggestion was heeded? Whether you wish to admit it or not, you called for us all, regardless of our individual exercise of the right to keep and bear arms, our age, and our faith, to be condemned to victimhood in support of a social agenda, Mr. Malone, and to abandon our natural right as given by God. It was unforgiveable and we will not forget, no matter in whose name you suggested it. The right to own a gun may not be a natural right, but what would you use for self defense, a butter knife? And in the future when lazer technology will ultimately render bullets primitive, will we not be permitted to own that technology, to preserve our right of self defense? The closing paragraph is extremely lame, as is the entire piece because it fails to make a convincing case that we will be safer by repealing the 2nd Amendment. When advocation is made that only some groups should have guns, (i.e. police, military), the bloody lessons of original sin and history are ignored. If one group has guns and another doesn't, those with can subjugate those without. Are the MILITARY shootings at Ft. Hood forgotten? Have the shootings by rogue policemen or people posing as police such as Norway forgotten? 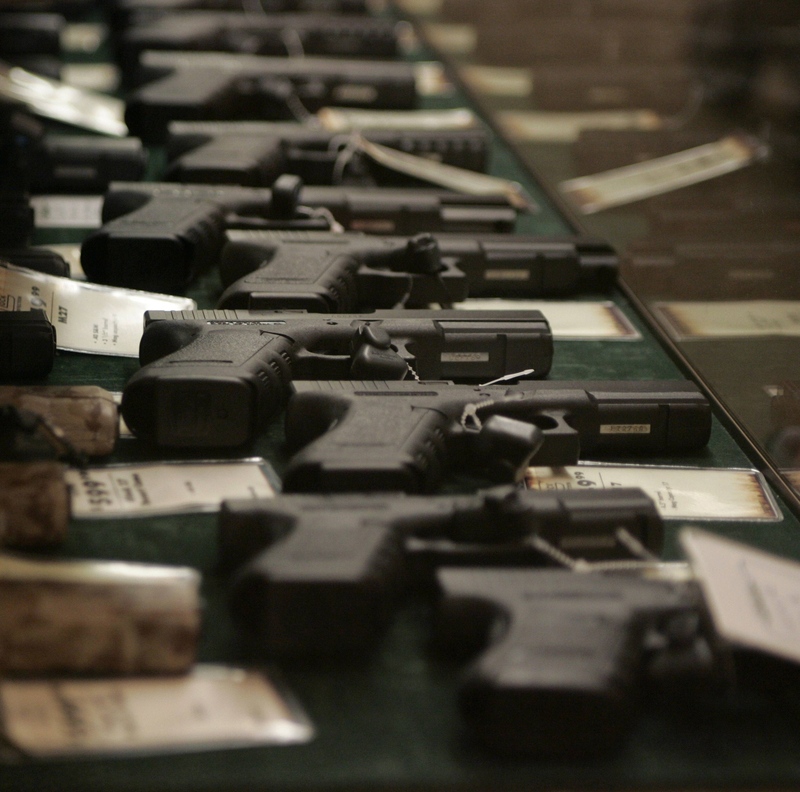 Has the reality that criminals can always get guns, regardless of laws and rights? The Soviet Union had lots of military and KGB but a few subjugated an entire people. The same magazine which runs a decent article on drones, fails to recognize the only options a people might have should their government turn those drones on them. And that was the intent of the founders. Forget history at your peril. Gun control is a joke and a farce that is only made worse by the fact that we're at the leading edge of a technical revolution that will allow anybody to build their own gun at home. Those who bear evil in their hearts will not be denied arms for very much longer. Printable guns have been made and are undergoing refinement and testing. The plans to print such weapons will be freebies available for criminals as a cheap loss leader for other services. Within the next decade the full line from bullet to cartridge to magazine to the gun itself will all become a home manufactured item, untraceable and able to be generated anywhere. The culture of life cannot be supported by legal bans but by a change in the hearts of people including a healthy gun culture that teaches all the many, many circumstances where resorting to the use of a gun is not permitted. There is no healthy gun culture in areas with heavy gun control. It shrivels and dies. The gun culture of the hoodlum, the thug, the gangster, that is the gun culture that thrives. Gun control advocates say that the first responders should have the guns, not citizens. But when my wife hears a noise and thinks someone is in the house, her elbow to my ribs to wake me up makes me the first responder. The police get to be second responders. Gun control disarms the first responders, and it has tragic results over time. Repealing the 2nd amendment doesn't necessarily take away the right to bear arms; it would acknowledge that the right is not absolute and, thus, subject to reasonable regulation as are the right to drive a car, the right to fly a plane, the right to practice medicine or law, etc., etc., etc. The "right" to drive a car or fly a plane was not specifically enumerated in the Constitution, nor was the "right" to practice law or medicine. Given the recent revelations about the IRS, I'm wondering if this statement, "Does the threat of tyranny, a legitimate 18th-century concern but an increasingly remote, fanciful possibility in the contemporary United States, trump the grisly, daily reality of gun violence? ", needs to be revised. Current events show that the threat of tyranny does still exist in the U. S.
I'm convinced that the recently exposed activities of the IRS as well as the existence of the Patriot Act are sufficient evidence to demonstrate that any group, any group at all, that finds itself afoul of prevailing thought of whichever end of the spectrum is currently in power is a potential target for harassment. That is the beginning of tyranny. Unfortunately, it would seem that twenty-first century Americans may be more at risk than our eighteenth century ancestors. Having worked in the emergency department of a major trauma center, I probably lean a little more toward gun control, but having seen the behavior of Gov. Andrew Cuomo in passing the SAFE Act (late night strong-arming,) I think we need to keep the Second Amendment, with its protections for law-abiding and stable citizens to keep and bear arms responsibly. The U.S. Constitution does not give you the right to bear arms because of what an individual citizen deems to be tyranical behavior by our federal government. What you speak of is in the Consitution as well, it is called treason. Anyway, this is a Catholic magazine and as Catholics I do not think it is okay that we engage in violent acts because of the activities of the IRS and some wiretapping program. You are right to be concerned. This 18th century vs 21st century argument meant nothing to Putin. If there might be a change in the make up of the court, then perhaps the interpretation could be made that the intent of the second amendment was to enable a "well armed militia" to exist. The 1792 law requiring each male who was eligible to serve in the militia to own a gun helps reinforce that rationale. The title refers to a more effective way to provide for the national defense by establishing a uniform militia throughout the Unites States. http://memory.loc.gov/cgi-bin/ampage?collId=llsl&fileName=001/llsl001.db&recNum=394 is the text of the law I'm referring to, and it was enacted in 1792. That argument was tried and found wanting a few years ago when , the supreme court, ruled in a 5-4 decision, that the "right to bear arms" superseded the need to provide for a militia. A right is a right, regardless of circumstances that may have been a (necessary) contributing factor at the time. Excellent observation, except you fail to mention that the Militia Act was updated several times since then, the last incarnation being found in 10 USC 311 (available at http://www.law.cornell.edu/uscode/text/10/311) which states what the militia is composed of, specifically "all able-bodied males at least 17 years of age and, except as provided in section 313 of title 32, under 45 years of age who are, or who have made a declaration of intention to become, citizens of the United States and of female citizens of the United States who are members of the National Guard." Were you attempting to imply that militia as a whole equaled the National Guard? I hate to break it to you all.... but the pro-2nd Amendment camp has a VERY good argument as to why the 2nd Amendment is NOT outdated. Since the invention of the printing press several centuries prior to the drafting of the Constitution, technology had been increasing slowly decade by decade. The founding Fathers were by no means foolish enough to believe that at the end of the 1700's---humankind had reached the Apex pinnacle of civilization. They knew that general technology, & weaponry development would continue to advance to much higher levels. So thus would the technology at the disposal of our future Governments---and the potential power that comes with it would advance as well. For clarity, as guns improved over time past, the founding fathers knew that musket gun technology was NOT going to be the grand ending of fire-arm development. They drafted that Amendment knowing full well that fire-arms were going to advance in power, accuracy, & capability. This law however was a safe-guard against the future tyranny that would inevitably infest the U.S. government in a future where the European bankers would eventually regain their foothold here---& in turn corrupt our leaders into complying with their schemes & Agendas and thus re-enslaving America to the Agenda of the InterNational Bankers. Men like Thomas Jefferson constantly railed about our need for our future generations to be ever vigilant against serpents who in the future will try and persuade We The People to give up our Arms for a feigned 'security'. What Mr.Jefferson warned us about is coming true today. Many elite powerful forces in collusion with the Billionaires & Bankers who own the main Media are constantly trying to brainwash We the People into giving up our 2nd Amendment through slanted media reporting and appeals to emotional pity that strikes at the deepest psychological achilles-heel vulnerability a human has::::::"BUT WHAT ABOUT THE CHILDREN!!!!" Adolph Hitler in Mein Kampf is quoted as saying that there is no better way to convince fools to give up their rights than to claim it's for 'The Benefit of the Children'. These powerful and relentless forces who are constantly trying to disarm us and will stop at nothing short of creating false-flag incidents for their justifications------ have a very ominous plan for us indeed if they soooo fear an armed populace who is capable of fighting back. In truth...More people die from DUI per year than by fire-arms each year in our country. Why is there no outcry to ban cars & alcohol when the death equivalent of a Newtown massacre occurs EACH & EVERY SINGLE DAY? ?--------Because of economics. What I've written here is only the beginning of the arguments the 2nd Amendment Preservationists convey. If we continue the "tranquility" excuse, one can argue that totalitarian states are much more "tranquil", couldn't they? At least, until one considers the violence committed by agents of the state to ensure that tranquility. How much freedom are we willing to sacrifice in the name of security? I recall Ben Franklin having a choice comment about exactly what believers in such a concept really deserved. This is a naive and appalling editorial unworthy of the level of intellect that I have come to expect from the Jesuits. It's interesting that the main and compelling reason for a responsibly armed citizenry, holding the tyranny of the state at bay, is dismissed in one sentence as a "remote and fanciful possibility." Based on what evidence can you assert that the possibility of the state rising to the level of tyranny is "remote" other than your own, dare I say, faith? Could it be possible that state tyranny is held at bay by the existence of the very amendment you call for repeal? Do you truly believe that we as human beings are beyond electing earthly leaders whose proclivities are bent toward imposing prejudicial legal sanction against members of different groups including religious ones? It is ironic that you consider the possibility of tyranny "remote" yet you fail to map out a plan for the disarmament of the average citizen. Do you believe that people will simply accept this repeal of the 2nd Amendment and willingly hand over their arms to representatives of the state. What if they do not? I assume that under the threat of force they will have their weapons confiscated. Sounds to me like this "remote and fanciful possibility" has just become a real issue, direct, and close. Will you be ministering to the new occupants of the prisons that refused to turn in their weapons? In the post repeal world, as you call it, you have your vision of those who will, in your kind benevolence, be permitted(?) to possess firearms, including those with "morally reasonable purposes." Who is going to sit in judgment of and determine the moral reasonableness of one's purposes? Your loopholes, exceptions, and vague categories of acceptability all but render the effect of your repeal laughably toothless. In the end, this silly, vapid, and intellectually unserious piece smacks of little more than empty posturing. You can do better, Jesuits, much much better. If you want to fight a hypothetical future tyrannical government, learn hacker skills. Guys with popguns will be deleted using surveillance, metadata mining, and drones. Small arms will be of little use, except in the movies. Please, tell us exactly how effective those were in ensuring the IRQ and AFG excursions only lasted 6 weeks. This article hits the nail on the head. The 2nd amendment is soaked in the blood of Americans. Repealing it is the only solution .Every time the citizens of this country make progress to curtail gun deaths some court reverses that only because of the 2nd amendment. If today American citizens could directly vote on this, the amendment would be repealed. Really? Between 1.5 and 2.5 million lawful defensive gun uses compared to 30,000 "gun violence deaths", that include over 15,000 which are suicides that would likely occur even if all guns were outlawed as well as around 450 Lawfully Justified Homicides of criminals killed in the act of committing a felony by police or law abiding citizens. The vast number of the remainder are committed by people already prohibited from owning guns who had unlawfully purchased them (felony) and were unlawfully possessing them (felony) when they used them in the commission of yet another felony, typically against another criminal, and typically over drug sales or gang affiliation. And you think that passing another law will seriously dissuade these offenders? But please, don't let facts interfere with your righteous indignation. After all, it's for the children, right? The fact is that the banning of firearms only increases crime as a whole. Canada, Australia, and England showed these trends and it continues today. The lie in the article is that so many people are shot and killed each year. If you remove the number that are killed by Law Enforcement, the values take a sharp turn down. More people are killed each year by Knives than guns. Do they want to ban them as well. The fact is that if every person was trained, and carried who was an adult over 21 and not a felon. With the obvious fact about mental states of these people. Then crime would decrease. The facts are out now and crime in DC has gone down along with Chicago. So allowing more guns decreased crime. So why do the Anti Gun Liberals continue to lie and create more restrictions. "... the threat of tyranny, a legitimate 18th century concern but (an ) increasingly remote..." This is the same "fanciful" argument that the President used to reproach Vladimir Putin's seizure of the Crimea, referring to his 19th century mindset in the 21st century. Tyranny respects no time frame, geographical boundary, or quaint ideologies . As suggested earlier, this country remains free, although less and less so, partially because of 300 million guns in the hands of its citizenry, and not the hopey, changey panacea of the liberal left wing. At one time Roman Catholicism was believed to be the only way to enter Heaven, despite its short comings. Perhaps the price we pay in the United States for bearing arms is what is necessary for a strong country and a world at peace, relatively speaking, so help us God. A "minority"? Please, cite your sources, preferably with breakdown indicating the difference between urban and rural areas. Examples like this are why the Founders instituted the Electoral College and established us as a representative republic instead of a pure democracy - to protect us from the threat of an uneducated mob of an urban electorate overwhelming the country by simple numbers. And nice attempt at ridicule with the "tri-corner hat" comments. My ancestor may have worn one when he stood in Lexington, but I don't have one, nor do any of the other people I know who support this issue. We wore steel, or Kevlar when we served. What did you wear? Given your disparaging dismissal of the Founders I have to ask - was it a Che shirt? delusion and paranoia are the two themes of the writers attacking this column; delusion, perhaps fantasy, of the modern minuteman standing on the "bridge that arched that April flood." For goodness sake, do you realize how silly you sound? please don't tell me that you own a fife and drum and a tri-corner hat, sitting there thinking how you'll hold off the red hordes; and paranoid, waiting for the government to "pry this gun from my cold dead hands." Certainly sad to think this nutty stuff is coming from Catholics! Very sad, if not pathetic, to see people commenting on this page referencing of the Founding Fathers, many who were slave owners, and a majority, if not all, voting to enshrine not only slavery; but one of the most inhumane and heinous forms of this sin, far worse then that of the Roman Empire; into the Constitution. Obviously the Second Amendment should be repealed to stop the gun proliferation and the resulting horrible bloodshed in America. However, that aim is very hard to achieve because the NRA and gun lobby, in collaboration with the blind obstructionist GOP and corrupt politicians, continue to have the upper hand in Senate and always be ready to slap down any gun legislations proposed by the government. I think only when the majority of Americans are awaken to the harsh reality of the right of bearing arms and help defeat the powerful gun-profiteering camp led by the traitorous NRA leadership, that America has a chance to get out of this horrific gun violence trend.